Given rice is a staple and often a main component of the Japanese meal, not surprisingly, there are several variations of rice that are popular among Japanese cuisine. One popular style of rice is called maze gohan, which is pronounced maa-zeh gohan in Japanese, which is a broad term which refers to “mixed rice”, regardless of its ingredients. Sometimes the term maze gohan may also be used to refer to another type of Japanese rice dish known as takikomi gohan where rice and various ingredients are steam-cooked together in a light soy sauce or dashi-based broth. There are no rules when it comes to maze gohan. In other words, any type of ingredients may be used such as fish, seafood, and vegetables, although proteins such as chicken and beef are less common in ma-zeh gohan. Edamame, which is in season during the summer, is a wonderfully nutritious and popular vegetable to add to maze gohan during the warmer months, and in our family it is especially popular among kids. 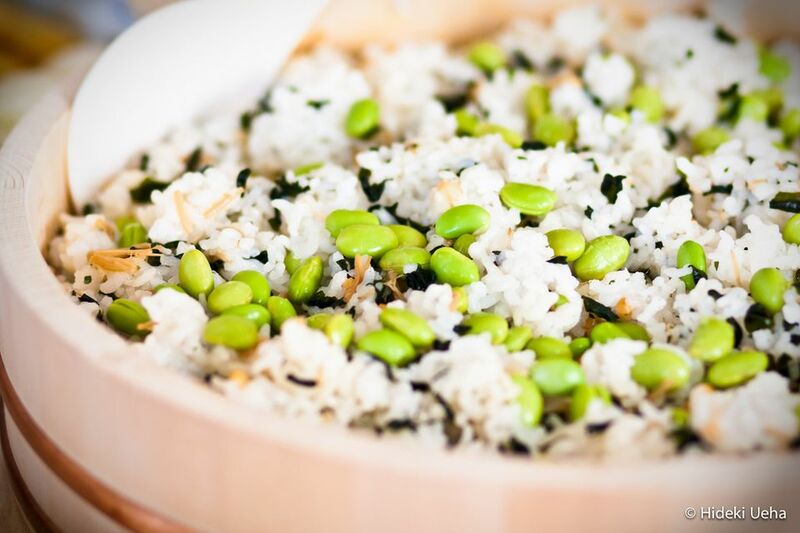 This edamame ma-zeh gohan recipe uses brown rice mixed with shelled edamame (soy beans), nametake (seasoned Japanese mushrooms), and a dried rice seasoning or furikake as it is known in Japanese. This particular maze gohan recipe is a favorite of mine because it's easy to prepare, especially for large parties or for a potluck. Again, this recipe goes back to my fundamental belief that cooking Japanese food does not have to be complicated yet still yield delicious results. Try this edamame maze gohan recipe for your next meal or potluck. Most Japanese or Asian grocery stores should carry both Wakame-Chazuke Furikake and bottled Nametake mushrooms. Select an amount of rice depending on whether you are cooking for two or more. Wash brown rice well and drain until water runs almost clear. Allow rice to soak for 30 minutes, time permitting. Cook rice according to your rice cooker's instructions. While the rice is cooking, cook frozen shelled edamame in boiling water for about 5 minutes until the beans are tender. Drain and rinse with cold water. Set aside. After the rice is done cooking, allow it to rest in the rice cooker for about 15 minutes. Transfer the rice to a large shallow wooden sushi dish (or Japanese "oke"). Gently incorporate the Wakame-Chazuke (Green Tea) Furikake seasoning with the rice. If available, use a Japanese "shamoji" or rice paddle for ease of use. Add the bottled Nametake (seasoned mushrooms) to the rice and gently mix. Add the cooked shelled edamame. Serve immediately.